We never forget our childhoods, and I always remember the thrill of going to the circus. There were always the exotic zebras, the frightening lions, and of course clowns with foot wide smiles. Read More! It was the 25th anniversary of the end of the Vietnam War last year but there was almost nothing in the way of commemoration of the event in Okinawa, a place that was heavily involved in the war. It was from here that B-52s took off for their bombing raids over North Vietnam from 1965 onwards. Read More! Amazing Discovery! Jewish Mother Found in Okinawa! For the vast majority of you in Okinawa who did not experience the tragedies and triumphs of growing up Jewish, it is a difficult cultural experience to relate in words. How can one adequately describe the shopping habits of the average Jewish American Princess, a creature so pervasive along the Eastern Seaboard of the United States that entire department stores, clothing chains, and jewelry outlets are dedicated solely to servicing the material wishes of this one group? How can someone, especially from an Asian cultural milieu, ever grapple with the biblical proportions of Jewish guilt, or the importance that Jewish households place on marrying a nice doctor/lawyer/ only-as-a-very-last-resort, dentist? And, most importantly, how could I ever explain to any of my Okinawan friends that most singularly holy yet simultaneously terrifying of characters, the Jewish mother? Yet, since I moved to Okinawa, I’ve had ample practice in attempting to explain all of these finer points of Jewish culture, and more. Read More! 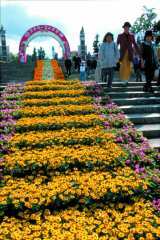 The 18th Annual Okinawa Flower Carnival opened last Saturday and is scheduled to run through May 6. The opening ceremony was held in Nago City. Read More! In the final installment of our series on the historical sites chosen by UNESCO for World Heritage status, this week we focus on two sacred places, a mausoleum and a garden, Ryukyu cultural legacies which now have the recognition of the wider world. Nine remnants of the Ryukyu Kingdom were chosen for registration as World Heritage Sites. Read More! This letter is in response to the person or persons who wrote the “Why not allow Okinawans access to bases” letter. First off, I would like to ask you if you have forgotten that you are the reason we are over here. Read More! In response to all the replies generated by Dominic’s “Why Not Allow Okinawans Access to Bases?” letter. Using a quote from the Morning Star newspaper: Okinawans have enjoyed a womb to tomb existence over the years. Read More! The problem of allowing Okinawans access to military installations is not the real issue. It is not Okinawans that are restricted from military installations but CIVILIANS, both American and Okinawans. Read More!